Navratri I Festival of Nine Days.This nine Day people Playing a Garba and ras dandiya at night.this Festival is Known in Gujarat.And very High Celebraty in Gujarat. 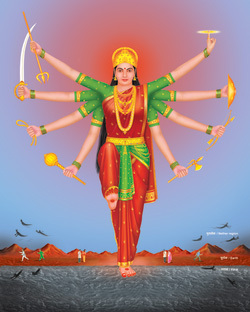 Navratri begins on Ashwin Shukla .on this year. According to one school of thought, Sri Mahakali worshipped on the first 3 days of Navratri, to reduce the tama component in ourselves. The next 3 days, to enhance the raja component in ourselves, Sri Mahalakshmi is worshipped and on the last 3 days, to intensify the spiritual practice, Mahasaraswati is worshipped. Chant the Names of these Deities during these days. To learn more, obtain your copy of the Holy text ‘Shakti’, published by Sanatan Sanstha from the Sanatan centre nearest to you.